The DIABOLO project is proceeding in harmonising the processing of data and the reporting of information for forest biomass estimation and other ecosystem goods and services. The annual project meeting in Vienna highlighted the progress in developing distributed, integrated and harmonised forest information for bioeconomy outlooks. The DIABOLO annual project meeting took place at the BFW and IIASA in Vienna and Laxenburg, Austria on 4-5 May 2017. Photo: BFW 2017. The DIABOLO annual project meeting took place at BFW and the IIASA on 4-5 May 2017. 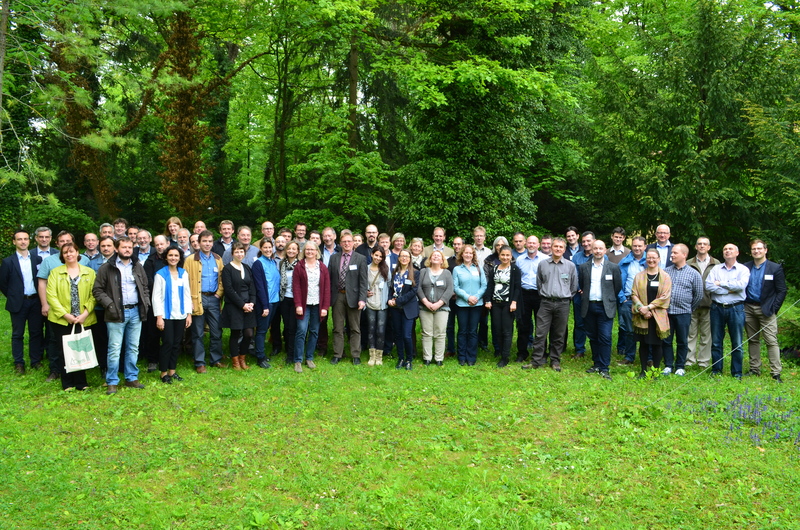 It brought together over 60 experts and scientists from 33 leading European scientific institutions in the fields of quantitative modelling, policy and social science, and national forest inventories, all committed to providing new methodologies and information for a variety of end-uses within the ecological, social and economic diversity in Europe. In Vienna, the DIABOLO Working Groups (WG) reported on their collaborative research progress and outlined their next steps for the months ahead. During the meeting in Vienna it was decided that WG 1 – Policy analysis of demands for and provision of forest data will organize three participatory dialog groups in 2017/2018 focusing on sustainable timber production, forest biodiversity and climate change and energy. “Policy makers, forest managers, data providers and key stakeholders from different levels and policy sectors are invited and expected to identify options for bridging “gaps” between forest information demand and supply, and to suggest strategies on how to improve the knowledge communication and information exchange with regards to forests”, says DIABOLO project coordinator, professor Tuula Packalen from Natural Resource Institute Finland (Luke). Within the next year, WG 2 – Harmonising growing stock, biomass and carbon estimation and forest state monitoring based on field and high-resolution remote sensing data will focus on finalising procedures and equations for harmonised stem volume, total volume and biomass estimations to be applied by DIABOLO’s National Forest Inventory (NFI) partners. In addition, innovative algorithms for multi-source inventories and statistical estimators combining cross-country NFI plot data with various types of remotely sensed auxiliaries are also at the stages of implementation on different case studies. Progress has also been reported in Vienna within WG 3 – Improving data collection and analyses for multipurpose inventory of forest resources in the combined use of NFI and land-use/cover datasets for delivering indicators dealing with biodiversity, conservation, forest hazards, non-wood forest products and social functions. As for WG 4 – Monitoring disturbances in European forests based on space data a European earth-observation based monitoring system for disturbances in forests is being developed and tested. This service’ test phase will be started after both Sentinel satellites, 2A and 2B, will be in full operational service end of 2017/early 2018. Also the WG 5 – Model-based biomass supply analysis for bioeconomy is on track in developing a distributed but integrated mechanism for up-to-date forest resource and woody biomass supply estimates responding to information needs in Europe. In Vienna the DIABOLO stakeholders (EEA, JRC and UNECE) agreed that the DIABOLO project will strengthen the methodological framework for more accurate, harmonised and timely forest information to support the development of EU policies and international processes. DIABOLO – Distributed, Integrated and Harmonised Forest Information for Bioeconomy Outlooks. This project has received funding from the European Union’s Horizon 2020 research and innovation programme under grant agreement No 633464. Project duration: 1.3.2015–28.2.2019. Coordinator: Natural Resources Institute Finland (Luke).